NATO leaders are meeting in Brussels today (25th May, 2017) as part of US President Donald Trump’s first foreign trip as commander-in-chief. euronews’ Andrei Beketov sat down with Jens Stoltenberg, NATO secretary-general, to discuss the alliance’s role in fighting terrorism, defence spending and transatlantic ties under Trump. euronews: Secretary-General, it would be an occasion to celebrate the new headquarters but sadly we are talking in the aftermath of another atrocity this time in Manchester. Isn’t it time for NATO to join the coalition the Islamic State and fight it? euronews: And what about boots on the ground. Or is it just symbolic? Stoltenberg: This is not symbolic, this is a strong political message of unity in the fight against terrorism and a platform for improved practical cooperation and support, coordinating the efforts of NATO and the other coalition partners. NATO is not going into a combat role. What NATO is doing is to training and capacity building. euronews: “You are meeting the new American president. What effect is Donald Trump already having on European defence spending? Stoltenberg: He expects European NATO allies and Canada to deliver on what we decided in 2014. And I, of course, think that this is important. Not only to please the United States, but because it is in Europe own security interest to invest more in defence when the world has become more dangerous. That’s exactly what we are doing. Because in 2015, we had the first years without any reduction in European defence spending after many years of decline. In 2016, we saw a significant increase. So European NATO allies have really turned a corner after many years of decline, defence spending has started to grow again. And we are moving in the right direction. euronews: Mr. Trump doesn’t mention Russia as a threat. Are you going to convince him about that or are you going to soften your own stance? 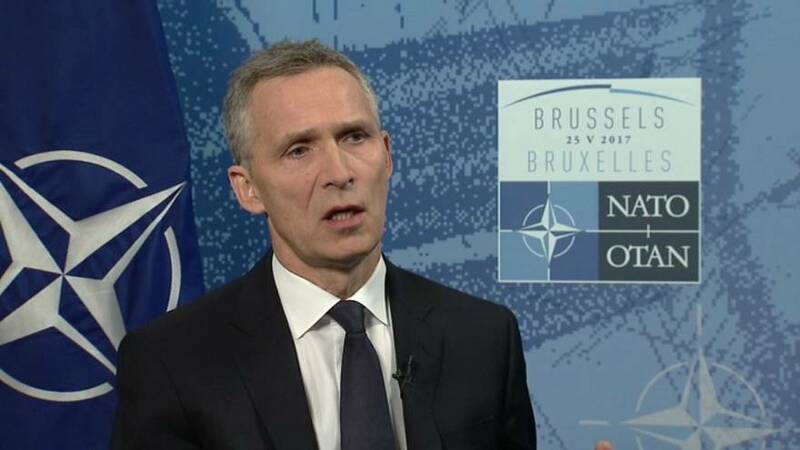 Stoltenberg: NATO has a very clear position on Russia. And that is that we need a strong deterrent and dialogue combined. We cannot choose between either dialogue with Russia or deterrence and defence. We need both. And there is no contradiction between strong defence and political dialogue. I met President Trump a few weeks ago in the White House. He shares and supports the NATO approach to Russia – defence and dialogue. Russia is our biggest neighbour. Russia is here to stay. NATO does not want a new Cold War or arms race. So therefore we need to engage in political dialogue with Russia, but based on our collective defence and credible deterrence.